Does Leptin Make You Fat? Leptin is a hormone produced by the fat cells in the body. When the fat cells are full of stored fat, they produce leptin. This is sensed by the brain and decreases appetite, while increasing calorie expenditures (less calories in, more out). It is part of the body’s complex system designed to regulate energy storage. If, for instance, a human goes through a drought where there isn’t enough food, at first the cells release stored fat to be used for energy. As the drought goes on, leptin levels go way down. This first of all makes the person hungry, and also decreases calorie expenditure so the stored fat is used sparingly. When the drought is over and food is plentiful again, the person eats until the fat stores are replaced, when leptin levels rise again and appetite decreases and the metabolism goes back up. OK, so now we know that high leptin levels make you feel full. What happens in an obese person? Interestingly, tests have shown that leptin levels tend to be HIGH in obese people, especially those who have diabetes. Why is this? Last week we talked a bit about fructose and how it contributes to weight gain. Remember, fructose (present in ALL sweet foods) makes insulin resistance worse, and also contributes to LEPTIN resistance. Just like insulin resistance, where the pancreas makes insulin but the body tissues don’t respond to it normally, there is also LEPTIN resistance. The fat cells make leptin like crazy, trying to signal that there is plenty of energy storage and there’s no need to take in more calories. But the brain doesn’t get the signal. So how can we increase leptin levels and decrease leptin resistance? The most important leptin sensitizer is actually getting enough sleep! Sleep deprivation (less than 6 hours per night) lowered leptin levels and has long been known to cause weight gain. If you are obese the simplest intervention you should make is to sleep at least 7-8 hours every night. If you wake up tired after 8 hours of sleep, make sure to have your doctor check for sleep apnea. Interestingly enough, bariatric surgery dramatically corrects the leptin resistance and lowers leptin levels as it promotes weight loss. This is definitely NOT completely understood but it is becoming clearer all the time that the main mechanism of bariatric surgery-related weight loss is not mechanical at all but hormonal. Bariatric surgery alters the hormones related to hunger and satiety, which also regulate fat storage and mobilization. There are a few supplements that help increase leptin levels. One is omega-3 fatty acids, usually taken as fish oil supplements. Another is melatonin. Two others are L-carnitine and conjugated linoleic acid (CLA). Remember, megadoses of these supplements should NOT be taken with an eye to promoting weight loss. All supplements have risks and should be used under the direction of your doctor. Weight loss is complicated! More and more research is coming out showing that the cause of obesity is NOT simply eating too much and not moving enough. In addition to watching your calorie intake and getting active, if you’re trying to lose weight you should definitely avoid sweet foods and beverages wherever possible and make sure to get enough sleep. This will help keep your leptin from working against you! Fructose: Is It Bad For You? There is a lot of controversy surrounding the use of high-fructose corn syrup as a sweetener in foods nowadays. I’ve been reading a lot of research about fructose and its effects on the body and thought I’d summarize. Back in the 1970s researchers found they could make a very cheap sweetening agent from corn. It really caught on in the USA because we have huge supplies of corn but not a lot of sugarcane. High-fructose corn syrup became an enormously popular sweetener and today is used in all sorts of foods. The most widely used area is in soda. First of all, fructose is a monosaccharide (“one sugar”). There are three monosaccharides: fructose, glucose and galactose. In nature, sugars occur in the form of disaccharides (“two sugars”), which are two monosaccharies joined together. There are three main disaccharides: sucrose (table sugar, glucose-fructose), lactose (found in milk, glucose-galactose), and maltose (found in grain and beer, glucose-glucose). Other carbohydrates are in the form of polysaccharides (“many sugars”), referred to as starches. 1. Fructose is metabolized in the liver as if it were a FAT, not a SUGAR. It is changed directly to triglycerides, which are stored in fat cells. High fructose intake increases triglyceride levels in the blood. 2. Increased triglyceride levels increase insulin resistance. Insulin resistance makes it much more difficult to lose and maintain weight. It also interferes with energy metabolism and makes one very tired. 3. Fructose causes leptin resistance. Leptin is the current holy grail in obesity research. It is a hormone produced by fat cells that turns off hunger and craving signals in the brain. If fat cells make leptin but the brain can’t hear the signal, you will continue to feel hungry and experience cravings. Fructose makes it more difficult for the brain to hear the “satiety” signal that makes you feel full and satisfied. 4. Fructose intake also increases uric acid levels. Uric acid is central to the illness called gout (a severely painful and destructive joint disease). Gout is on my personal top-five list of illnesses I NEVER want to experience personally. What about fruit? It tastes sweet. Is fruit bad? It seems that if you consume fructose in combination with dietary fiber, it slows the absorption and processing and blunts the effect on triglycerides and leptin. So what is the take-home lesson about this little dissertation on fructose. It’s not something most people are going to want to hear. The bottom line is that if it tastes sweet, it has fructose in it. (Let’s leave the topic of artificial sweeteners for another day. I promise it is on the short list of future blog topics.) If it tastes sweet, it is NOT good for you and should be eaten in very limited amounts. Fruit is acceptable, but fruit juice doesn’t have the fiber and should be avoided. (Sorry that’s bad news for the juicing crowd). If you have a taste for something sweet, try a small bowl of berries or some apple slices. They should not trigger cravings if eaten in moderation. I promise you, after a few days of “detox” from sugar you will feel more energy and less aches and pains. Question (and challenge, LOL! ): Go look at the ingredient list on your favorite snack foods. Are there any that contain high-fructose corn syrup? Which ones? Those who have been following for awhile know that I am a sailor. I love the water, the wind, the sun, the boat, and the way it all works together to move the boat over the water. It’s like magic! You can check out this post from July to read more about my last sailing experience. 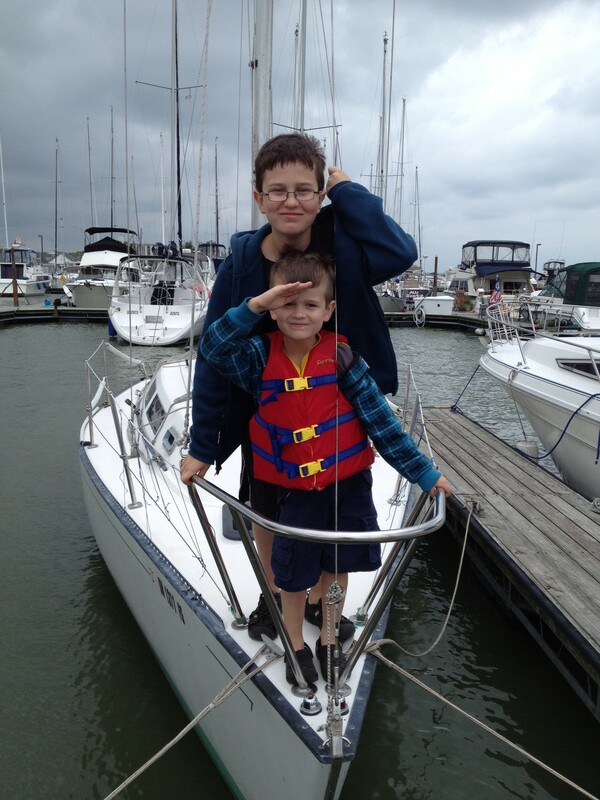 This past weekend my family and I spent Sunday sailing on Sandusky Bay. We chartered a sailboat and practiced our sailing skills. It didn’t exactly go as planned. You know what they say, experience is what you get when you don’t get what you want! What we wanted was a smooth, uneventful daysail with perfect weather. A sail where the completely uninitiated among us could ease into the ideas of sailing, get a little hands-on experience and just have fun. Instead we got 15-20 knots of wind, overcast skies, mid-seventies temperature (which with 15-20 knots of wind on the bay made for a chilly day), and a sprinkle of rain. We had two unexpected equipment issues and an inexperienced captain who completely froze when it was time to dock the boat. 1. It’s not easy being captain! This was my absolute first time out on a sailboat when I was the most experienced sailor on the boat. It’s not easy! You’re responsible for the welfare and safety of every soul on the boat as well as the safe operation of the boat itself. There’s nobody aboard to ask if you have a question or problem. I did have to call Captain Chris (Fair Wind Sailing Charters‘ EXCELLENT on-site charter support) twice and have him talk me through problems, but ultimately all went well. 2. Stuff happens. The weather conditions were pretty far from perfect, I had an inexperienced crew and a few equipment issues. So what? If you wait until everything is perfect you will never try anything new. Don’t wait for it to be perfect, just cast off and do your best. That’s the only way you learn. 4. Pull in your fenders. Did you read the post from July? Yep, I forgot. Don’t know if anybody teased me on the open channel because I was busy and not listening. If they were teasing me, I hope they enjoyed it. So will we go out on a boat again? Absolutely!! Will we consider getting more experience in controlled circumstances? Yes, but honestly, I think I learned more from two hours as captain than I will in any number of lessons. Might consider docking lessons, though. That would be good. I haven’t asked Captain Dave what report he got from Captain Chris, or whether he will charter a boat to me again in the future. What do you think? I did remember his number-one lesson: “Rocks are bad!” I didn’t find any rocks with my keel. I did look at the chart before heading out. Nobody fell overboard and nobody threw up. All in all, it was a pretty successful day. Question: Should Captain Dave charter me another boat sometime? Nowadays many people are very conscious of making healthier choices and convenience-food marketers are VERY aware of this. Are these “healthier” choices really better for you than their counterparts, or is it just marketing hype? I did some research and found four examples of items marketed as “health foods” or healthier choices that really may not be healthy options. 1. Beverages with added “stuff.” It’s got “vitamin” on the label so it’s good for you, right? Not necessarily. A brief review of several top brand labels revealed lots of sugar (32 grams for Vitamin Water Power-C, 30 grams for Gatorade Natural Blackberry Raspberry). Low-calorie options abound, but they have artificial flavors and sweeteners. You’re better off taking a good multivitamin once daily and drinking water with a little lemon or lime juice for added flavor. 2. Store-bought or premade smoothies. Even McDonalds is getting into the act! Are the smoothies a better choice than milkshakes, for instance? Well yes, since a large Wild Berry smoothie (22 oz) is 310 calories compared to 820 calories for a vanilla McCafe shake (WOW!). But it still has 67 grams of sugar (!) and artificial flavors. If you’re going to have a smoothie, you’re better off making your own, at home, with fresh fruit and other ingredients that you control yourself. 4. Frozen yogurt. The self-serve frozen-yogurt franchises are sprouting up like daisies. They are capitalizing on the idea that frozen yogurt is healthier than ice cream. But is it? A quick online search revealed that Menchie’s Vanilla Snow frozen yogurt is 100 calories per 1/2 cup serving, with 18 grams of sugar. Handel’s vanilla ice cream, on the other hand, contains 181 calories and 19 grams of sugar per 1/2 cup scoop. So yes, frozen yogurt has about half as many calories per serving. However, when was the last time you were in a Menchie’s shop? It’s self-serve so you can get as much as you want. It is VERY easy to serve yourself more than 1/2 cup. You also have access to lots of toppings and sauces and other ways to add calories. Bottom line, if you are careful about serving size and toppings, frozen yogurt IS a better option. Consumers have to be very careful to read labels and do their research. Just because something says “healthy” on the label does NOT mean it IS healthy. Making healthy dietary choices is super-important in trying to maintain weight and a good energy level. Question: What have you eaten that, after you ate it, you found had a LOT more calories, sugar, fat, artificial stuff, or other stuff that made you wish you hadn’t eaten it?